Back in 2013, the IceCube Collaboration published a paper announcing their discovery of astrophysical neutrinos, i.e. ones that have an origin outside our solar system (Astrobites coverage of the paper can be read here). Since this discovery, scientists have been busily working to develop theories as to the origin of these neutrinos. The original paper noted some clustering in the area of the center of our galaxy, but it was not statistically significant. Since then, both galactic and extragalactic origins have been proposed. Star-forming galaxies have been suggested as one possible origin, which Astrobites has covered papers arguing both for and against (here and here). Other theories involve radio galaxies, transients, and dark matter. 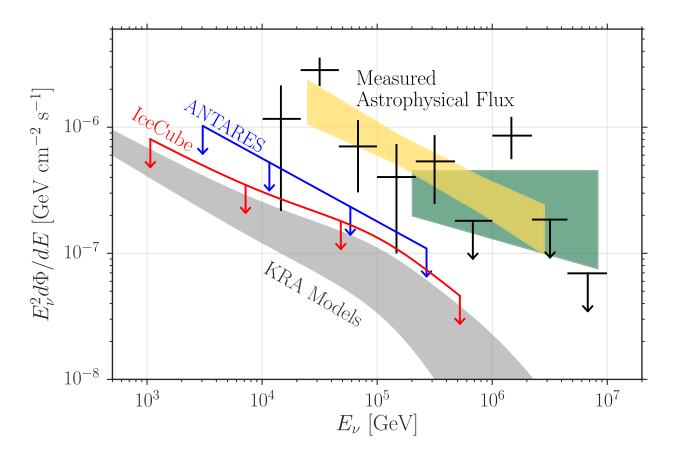 In today’s paper, the IceCube Collaboration has analyzed more of their data and set limits on the percentage of the diffuse neutrino flux that can come from galactic sources. Theoretically, some neutrinos should be created in the galactic plane: we know that this area emits gamma rays from pion decay, and neutrinos are created in the same types of interactions that create the gamma rays. The collaboration used an unbinned maximum likelihood method as the main analysis technique in this paper. This is a standard technique used in astrophysics; it takes a model and finds the values of all the parameters of that model that give the best likelihood of getting the data that has been observed. (A second, separate technique was used as a cross-check). They used five different catalogs of galactic sources expected to emit neutrinos to determine where to search. Sources included pulsar wind nebulae and supernovae interacting with molecular clouds. The upper limits on the flux from our galaxy can be seen below. I am a fourth year physics graduate student at Penn State University studying gamma-ray astrophysics. I previously received bachelor’s degrees in physics and astronomy from UMass Amherst in 2013. Pingback: Origin of IceCube neutrinos?